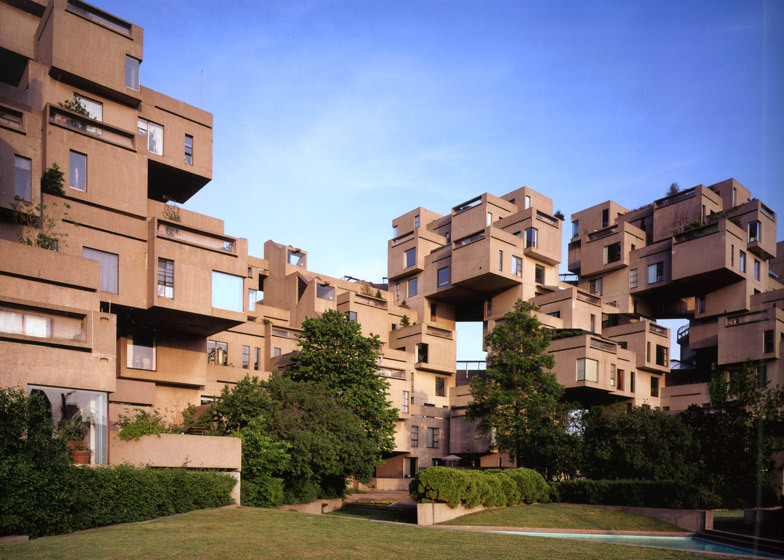 Brutalism: next up in our series on Brutalist architecture is Habitat 67, the experimental modular housing presented by Moshe Safdie at the 1967 World Expo in Montreal as a vision for the future of cities (+ slideshow). Safdie, an Israeli-born architect who moved to Canada in the 1950s, first developed the concept as part of his thesis at McGill University in 1961, entitled "A Case for City Living". Two years later, when the architect was just 23 and starting out his career in the office of Louis Kahn, his former tutor Sandy Van Ginkel suggested he submit his design for the Montreal Expo. It became his first ever built project. The original masterplan involved over 1,000 residences, alongside shops and a school. This was scaled down to just 158 homes, forming a 12-storey complex located beside the Saint Lawrence River in the centre of the city. By utilising a variety of geometric arrangements, making use of both setbacks and voids, Safdie aimed to create a series of properties with their own identities. Each one featured its own roof garden and could be accessed from an external "street" – one of Brutalism's key ideals. Safdie, who himself believes the project is "a reaction against brutalism", described his design as an attempt at a high-rise village – a way of upsizing from a micro to a mega scale. "I think Habitat was important at its time and resonated with the public because it proposed in realised form an alternative to the typology of the conventional apartment house," the architect told Dezeen. "The public recognised in Habitat the possibility that high-rise living could be more like living in a village and have the quality of life of a house than what they associated with the negatives of apartment housing. While there were many theoretical proposals floating in the air at the time, the fact that we had the opportunity to realise Habitat, and for 50 million people to experience it during Expo as a real and living environment, suggested that this was a possible future reality." Fifteen different housing types were developed. These varied between 60 and 160 square metres, each accommodating between one and four bedrooms. Six monumental elevator pillars were added to offer vertical access, stopping only on every fourth level to try and prevent unnecessary journeys and thus decrease the structure's energy consumption. To allow the prefabricated construction process to take place on site, a factory was built beside the site to produce the concrete modules, which were to be connected by high-tension rods, steel cables and welding. Safdie believed this to be the most cost-efficient solution – a decision that ultimately backfired with costs spiralling to CAD$22 million, which represented about CAD$140,000 per home. Despite this, the project has remained popular with residents. In 1986 the building was sold to its tenants for CAD$11.5 million – or around CAD$26,250 per residence – by a Quebec businessman, who had bought it from the government for CAD$10 million. "Everybody knows that Habitat was a money-losing proposition," Fritz Delphine, special projects coordinator for the Canada Mortgage and Housing Corporation, the agency that ran Habitat, told the New York Times. The newspaper reported that the design of the units, each with several exposed walls, made the building twice as costly to heat as any other building in Montreal. According to Safdie, many of the original occupants still live in the building, and the architect has also kept a residence for himself there. "A built fragment of a grander, mixed-use proposal, Habitat's concrete rawness speaks to Brutalism's beton brut – raw concrete – origin, but defies its massive image with a three-dimensional burst of individual module homes," said architect Wendy Kohn, a former colleague of Safdie. "Unlike Kahn or Corb's elemental, powerful Brutalist monuments, Safdie's Habitat suggests a spontaneous orchestration. Economics and luck dictated its singularity, but Safdie’s subsequent designs for desert, tropical, and compact urban Habitats around the world suggest its aspiration to multiply, adapt, and mutate, rather than stand rooted." "Habitat constitutes an urban vision of building economically but humanely, expressing individuality, but committed to solving enduring communal needs," she said. After the expo, the architect was commissioned to replicate the design in various locations around the world, from New York to Puerto Rico and Israel, although none of these were ever realised.